together to show incredible teamwork and dedication. BORP Jr. Road Warriors with their trophy after winning the West Coast Conference Championship in Denver, CO.
One of my favorite photos from the trip. The new kid on the block. 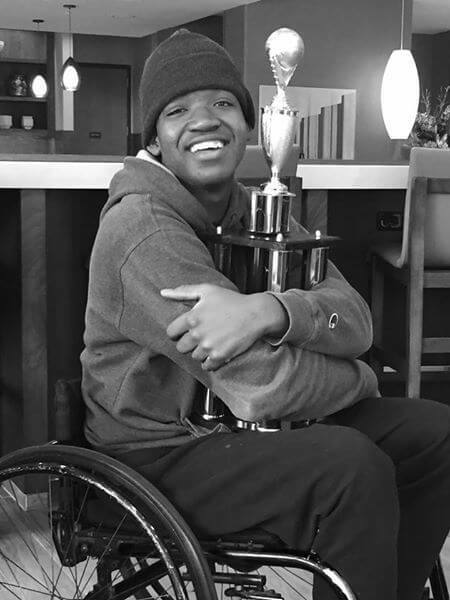 Stephen never knew there would be sports opportunities for him because of his disability and had no idea there were organizations like the Bay Area Outreach & Recreation Program (BORP) that provide these opportunities for kids like him. After his team, the Jr. Road Warriors won the West Coast Conference Championship Tournament in Denver this past weekend you could see how much it meant every time he grabbed the trophy. His face just lit up and he just kept hugging it. It was just one small step in the team’s journey, but a huge leap in his life. 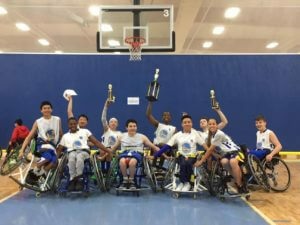 The Bay Area Outreach & Recreation Program’s (BORP) varsity youth wheelchair basketball team—Jr. Road Warriors—has just clinched the West Coast Conference Championship. The BORP Jr. Road Warriors came into the tournament as the #5 seed and soundly won all four of their games over the weekend, defeating Utah for the title. The tournament was held outside Denver, CO at the Gold Crowne Fieldhouse. Next stop: NWBA (National Wheelchair Basketball Association) Nationals March 29th-April 2nd in Louisville, KY! The NWBA will announce national and tournament rankings soon; now that the regional titles are settled. Players on the 2017 varsity BORP Jr. Road Warriors are in middle and high school, hailing from Berkeley, Bolinas, Gilroy, Oakland, Sacramento, San Francisco, Santa Rosa and other Northern California cities. Photographs available through the team’s photographer, Scott Goodman. The Bay Area Outreach & Recreation Program (BORP) Youth Sports Program provides sports and recreation opportunities to students with physical disabilities. Sports programs provide high caliber, competitive opportunities on par with school team sports, including prep and varsity wheelchair basketball, ice sled hockey and power soccer. BORP is based in Berkeley, CA and serves youth from all over Northern California.